With our social media savvy generation, where selfies and OOTD (outfit of the day) are part of our everyday routine. As you all know I myself am addicted to Instagram and have several accounts such as @tsinoyfoodies, @traveltripsters and @crumpylicious. Thus, it has become a must to have our hair looking awesome and controlled not just for the sake of vanity but also for the sake of art and keeping up with our generation. 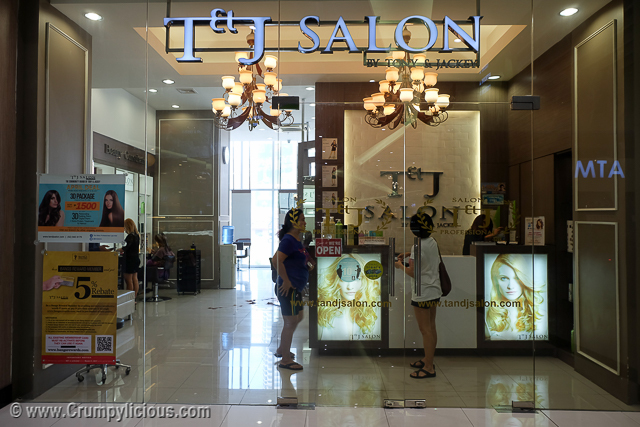 Since it's summer and for sure summer outing and events will be prominent, I opted entrust my hair care with T&J Salon by Tony & Jackey for a total summer make over. Upon stepping into T&J, I already knew I have come to the right place. The chandeliers give of a cozy yet elegant feel. It was well-ventilated with high ceiling so I didn't get overwhelmed with salon fumes that I usually encounter elsewhere. They space utilized with organization. 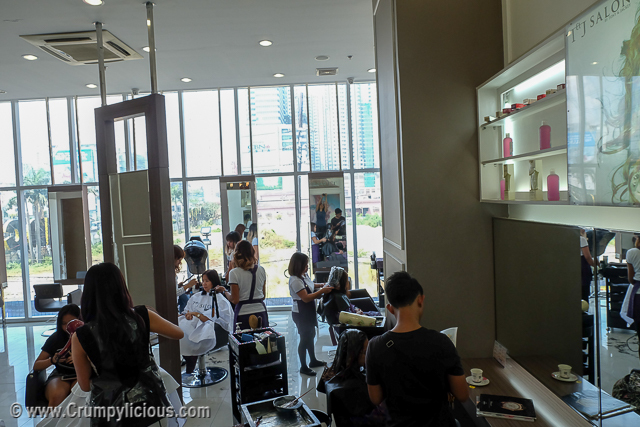 It was very spacious so even though they have a lot of hair stylists working at a busy pace with their carts moving around, you can still move with comfort. More importantly, it was very bright and squeaky clean. I notice how attentive they are in sweeping fallen hair strands. What a discipline! 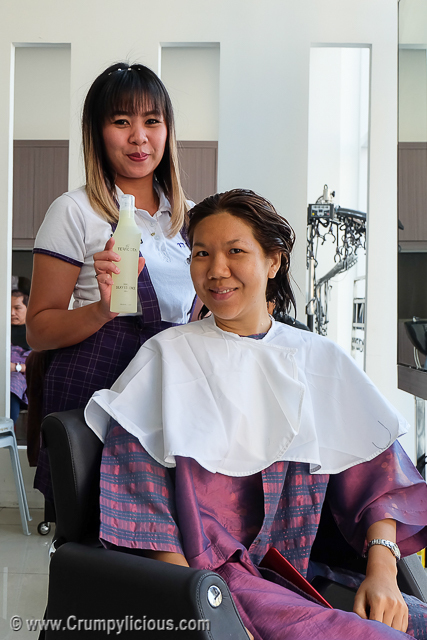 Whether it's shampooing your hair up to technical things like hair treatment, each and everyone of the assistants - those in checkered skirts, are capable of attending to your needs. While I was having my hair shampooed, ate (sorry forgot to ask her name because I was so into her tales) was proudly telling me all about her work. She told me their training is a meticulous process. Like in Taekwondo, they have several stages (white belt, yellow belt, green belt, blue belt, red belt and black belt) before become a certificate hair stylists (then you get to wear the cool white uniform). They have an exam every 3 months to see if you can progress. 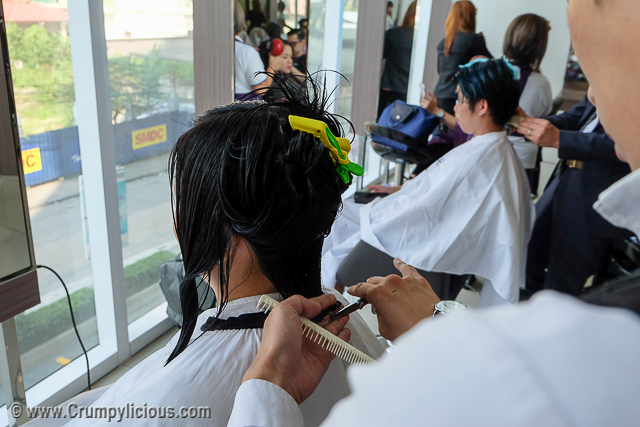 If you're a prodigy, you can become a certified hair stylist in a span of two years. But, many like ate cannot do so as they have to learn each step slowly and surely. 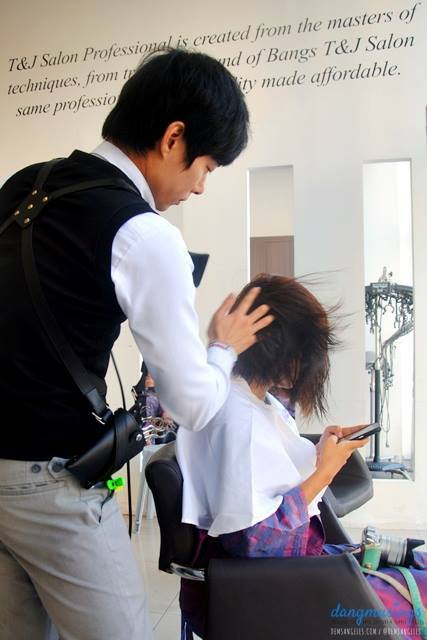 According to ate, she has been with Tony & Jackey Academy for around 2 years and she is currently a yellow belter. 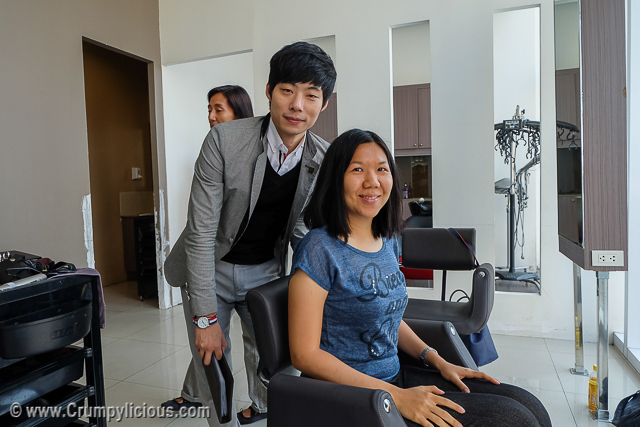 What's great about Tony & Jackey Academy is that the staffs get rotated in around their 50 branches so ate has had the chance to work side by side with Tony & Jackey's best korean hair stylists. 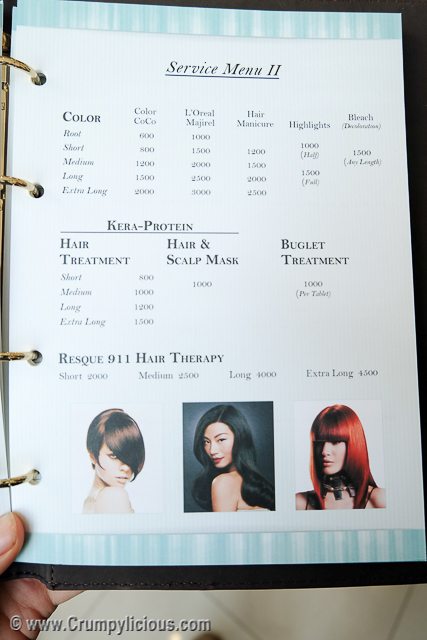 T&J Professional uses quality hair care products - mostly Korean brands imported from Korea except for L'Oréal. In every step of the way, ate was showing me each and every hair product that she is applying on my hair. She explains how it is applied, how often I can apply and it's purpose. T&J Professional also sells the products they use. If you can see the bottle instruction and boxes, they are in Korean but not to worry since T&J Professional provides instructions in English which you can get at the counter when you purchase them. 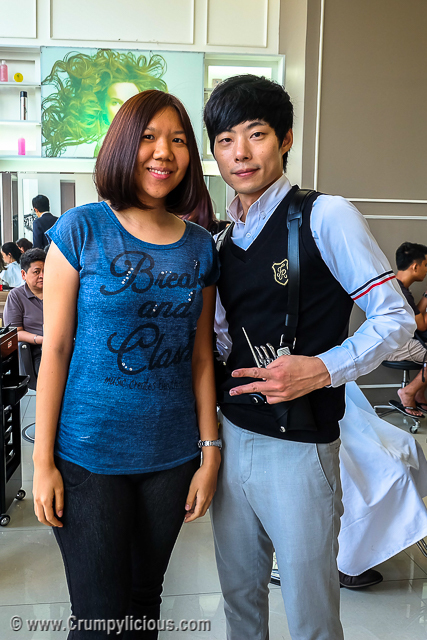 I was fortunate enough to meet and had my hair done by T & J Salon Operations Manager Seven (Sungbo) Lee. As you can see, I have a very thick jet black hair that's difficult to manage since childhood. My hair has always been challenging even for the best stylists. So I was really curious with how Seven will make it look better. Tada! 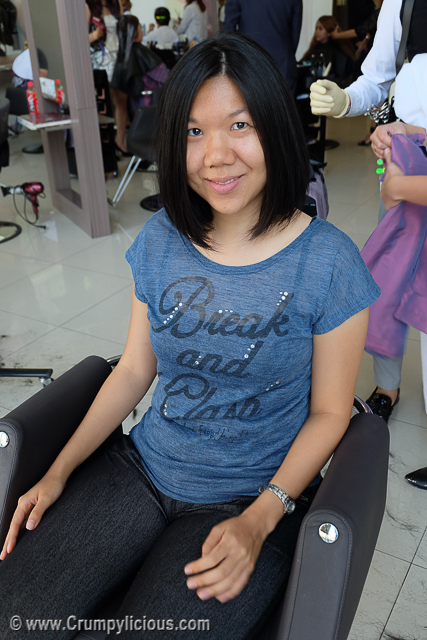 My new hairstyle for the summer! To complete my summer look, I also had my hair color. (Photo credits to DemsAngeles.Com) I left the color selection to Seven. So how's my new look? I am a firm believer that dreams do come true. Remember how our enthusiasm and passion starts of fiery and sparkly when we were kids. We have so much hope and energy to try and try. But, then we turn into adults and the fast pace world has made it more difficult for us to dream. And, you'd hardly encounter people talking and passionate about pursuing their dreams. 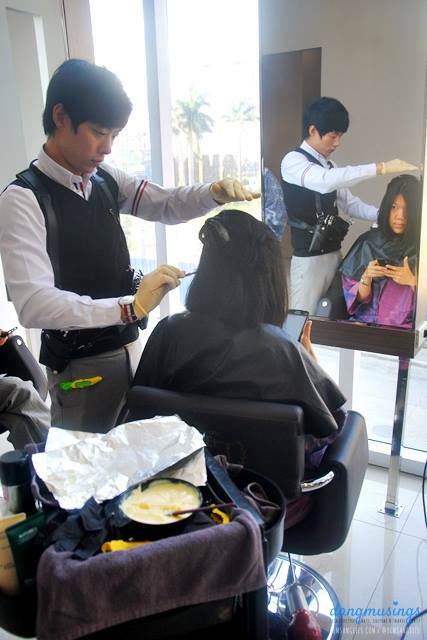 To my amazement, I could sense the passion of every Filipino assistant at T&J Professional to pursue their dream in being as skillful or even more skillful certified hair stylists as their Korean trainers and educators. 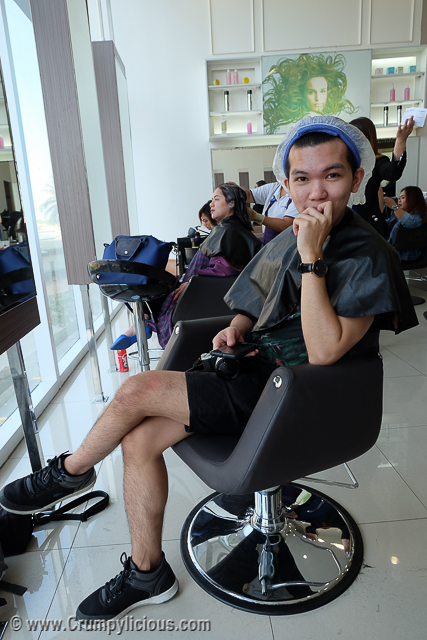 While Seven was doing my hair cut and hair color, I could see ate's sparky and gleaming eyes as she paid attention. I can't help but route for her and all the other Filipino assistants of T&J. 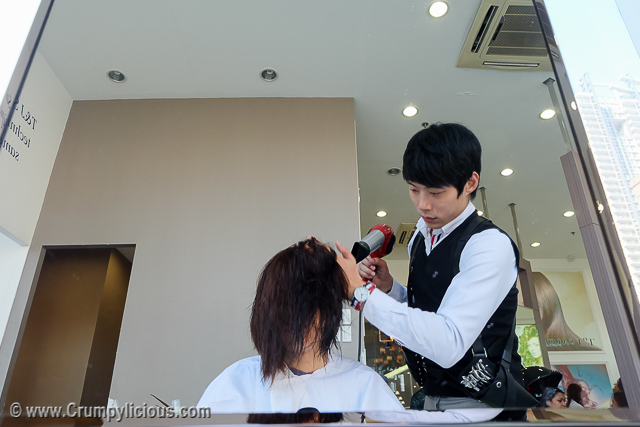 T&J is their training ground and it will also be their stage once they become a certified hair stylist. Yes, that's right. If Tony & Jackey Salon is where you can get premium hair services from professional Korean hair stylists and Bangs is where you can get affordable hair services also by Korean hair stylists, T&J is where you can get super affordable hair service performed by our very own certified Filipino hair stylists who were trained by Korean hair stylists and passed the certification of the Tony and Jackey Academy. Not that I'm a cheapskate but our hair must be maintained regularly so why not get one at an affordable price so you can continue to visit once every three months or oftener right? At T&J, the price is unbelievable affordable. 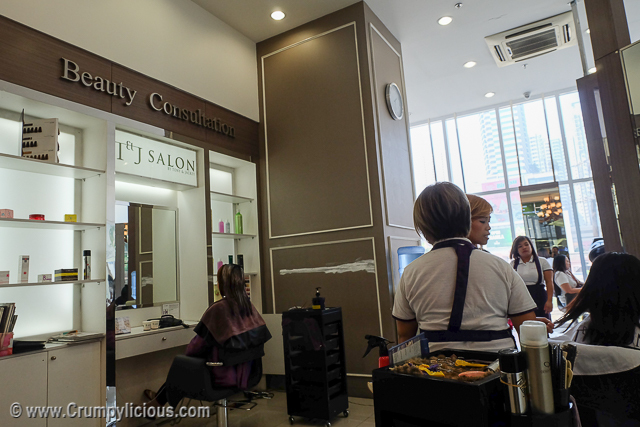 According to ate both Filipino and Koreans alike favor T&J for being affordable and yet you get quality service as they are all trained by Korean hair stylists. They have here almost all services except for the premium ones. 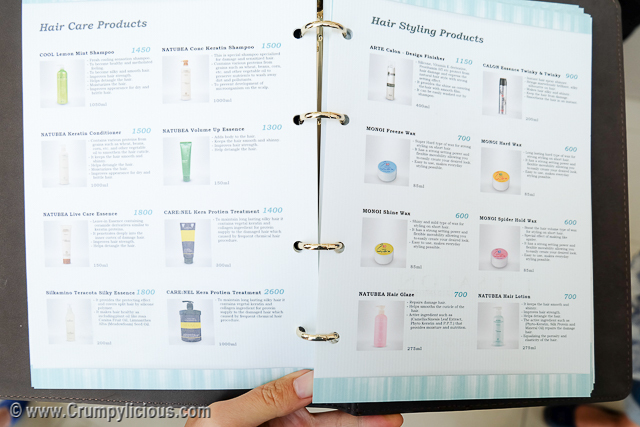 And, you can also purchase here the same hair products as sold in Tony & Jackey Salon and Bangs. My father has taught me to appreciate history because we can learn from the mistakes of the past. I thought I have grasped our Philippine history to a significant depth. But, perhaps not... I had no idea that I could have so many realizations from Bataan's 75th Araw ng Kagitingan Celebration. Just as its our human nature to make mistakes, we can also strengthen current friendships (US-Philippine Allegiance) and form new ones (Japan-Philippine Diplomacy). I am very amazed by Japanese Kenji Mori who spent millions for the prizes for the Drum and Lyre Competition, Poster-making Contest and the 25-minute long with75,000-shot fireworks during The Grandest Pyrotechnics. To find a man with deep pockets is not unusual. But, to find one with a sincere modesty, generosity and boldness to personally show himself and do the judging and purchasing by himself is quite rare. It made me think of who is more fortunate? Is it Bataan and other donees or Kenji himself who has the capability to change lives and touch the hearts of millions as he goes around places including Philippines to donate supplies and equipment for the benefit of kids? Just as Former Defense Secretary Gilberto (Gibo) Teodoro stated, only we - the Filipino people, can look out for ourselves so we always have to be ready. President Rodrigo Duterte also said that although the war is over, the fight continuous as enemies just present themselves in different forms such as drugs, terrorism and crimes. Whether it is combatants or civilians, we are all human. Each life is valuable. We all have our own dreams, values and skills. Such skill is proven by the Armed Forces of the Philippines as they played excellently with synchronicity. In Bataan, lies a greater story among the people of what truly happened pre-, during and post-world war II. Bataan is a province exactly where relevant hallmarks of our Philippine history such as the Death March took place. In Bataan, the youth are passionate, lively and determined. For each and every one of them know and value how much the war heroes and veterans have sacrificed for their future. With a wisdom and understanding that is beyond their generation, lies within them a more powerful and courageous spirit that can fly high to reach their dreams. As the saying goes, there is no other way but up. Bataan that was once destroyed is now a progressive province filled not only with a computerized education system but also filled with arts and music. I've always believed that culture is a good sign of literacy. And, Bataan's local artists have truly shone with their performance. My favorite part is the Aeta Choir. Their voices in harmony is so angelic. During the 75th Araw ng Kagitingan Celebration, President Rodrigo Duterte ordered the release of 6 billion pesos for the veterans’ pension. The wait for the release was really long. Most of the veterans have grown impatient. As most of them are over 90 years old. But, in the end, their sacrifices and wait have been rewarded. I'm not really a fan of energy drinks because of the loaded sugar, artificial colors and whatever suspicious ingredients mixed in. Before encountering E-Hydrate Protein-on-the Go, I usually just bring a bottle of water on my weekly jog. I bet you're wondering what made me try E-Hydrate right? For one, the summer sun is so intense reaching up to 29 degrees even on as early as 7 am in the morning. I found myself drinking water more than working out. I knew I needed an energy, protein and electrolyte boost. Luckily, Healthy Options offered E-Hydrate - an energy drink that clean with little or no sugar and has more protein than other energy drinks. E-Hydrate Protein-on-the-Go comes in 5 different product lines: Protein-on-the-Go Premium, Kids Protein-on-the-Go, Protein-on-the-Go ACTIVE, Natural Drink Mix and Kids Natural Drink Mix. I especially found the Protein-on-the-Go Premium quite convenient because I just drink it with me in addition to my bottle of water. Then, I just fill it up to drink. 1.) Twist off cap to open pouch. 2.) Squeeze side of bag to loosen settled product. 3.) Fill pouch to 50% FULL line and replace cap. 4.) Shake (up to 1 minute) until fully dissolved. 5.) Remove cap, fill to 100% Full line. 6.) Replace cap, shake again before consuming. The vanilla flavor is just fine with me but those who prefer a sweeter and more flavorful drink will like the chocolate flavor more. I bet the kids will also enjoy it. Price-wise and health-wise, I think the Natural Drink Mix and Kids Natural Drink Mix is a better option though, it has no sugar (only stevia) and it's also easy to use since you can just pour the mix on your bottle of water. I think it's great that they have different types and flavors. They even considered the kids. E-Hydrate is definitely a introduction for the kids on protein shakes. I will bring some of these on my hike trips too. When I first heard about Padyakan sa Bataan, I actually thought it was some sort of tricycle race. Then I saw the poster for the Padyakan sa Bataan 2017 and realized it was a bike race. To my surprise, this is the 12th Annual Padyakan sa Bataan. Aside from being free registration, there are trophies, medals and cash prizes for each category where there are 3 to 5 winners. We arrived at around 7 am and registration was still going on. Fox is one of the official sponsored and they have a booth set up. They were really generous in providing cool raffle prizes like Dry Fit Gloves, Dry Fit Shirts and more. They also provided Pump Trucks. At around 8 am, the program began with the push bikes. This is my first time to encounter push bikes so I found it interesting. The kids were really competitive. The push bike race was sponsored and organized by Strider. I've been told that this is their first time to do this. But, it looks like they can keep this going right? There are bigger kids too. They also look like they struggled more than the little kids. But, they all made it through. The program continued to small bikes. There were a lot of categories: Age Category, Fun Category, Heavyweight, Fat Bike and Single-speed categories. There are also fun races and more competitive races. The bikers are so lucky because it was a cloudy day. The sun was not intense and showed up only around the afternoon. The short races had 3 rounds each. Most of the bikers joined the fun race. In sum, around 670 bikers joined this year. That was around thrice from last year. The highlight of the event was the downhill race for pro bikers. The awarding was hosted by Mariveles Mayor Ace Jello Concepcion. Kids were awarded a medal and 500 php prize. While the adults up to veterans of 69 years old were awarded trophies, medal and 3,000 php prize each. The awarding lasted until 11 pm but everyone was still rowdy even then because of the hundreds of raffle prizes (which include bike gears, biker gears and Max's gift certificates) and fun programs such as the dance number by the Mutya ng Mariveles candidates and Miss Bataan 2016 Ambassadress of Investment and Industries Ms. Charlene Versoza. Congratulations Bataan Tourism for such a successful event!